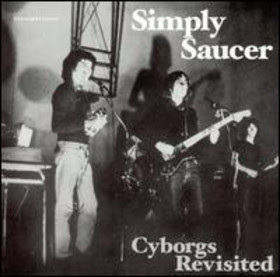 "Simply Saucer was Canada's first proto-punk band. Emerging in 1974 from the industrial city of Hamilton, Ontario, the quartet created a distinct and original sound that was decidedly out of step with the musical climate of the day...edgy rock & roll that was a combination of early '70s punk pre-cursors (Velvet Underground, Stooges, Modern Lovers), krautrock (ala Can, Neu, early Kraftwerk) and UK prog/psyche (Hawkind, Pink Fairies, Syd Barrett)...Although the only material released while the band existed was a two-song 45 rpm single, a 1974 recording session and a 1975 live set were collected together posthumously and released...in late 1989...Now long out of print, this newly re-mastered, expanded reissue is the first legitimate re-release of this material in more than a decade. Hailed as the 'best Canadian album of all time." I uploaded the expanded version of Cyborgs Revisited, which includes a few demos and live tracks. I had forgotten how much I loved this album until just recently. i don't believe this link is working anymore. sounds like it's a great album, i'd love to hear it! sorry to sound like a broken record, but could you maybe reupload? pretty please? i've been looking everywhere for this.